A full stage balloon show adds another options for booking, and can really set you apart from the competition! COLOR: That's an obvious benefit, and an attractive one. Never underestimate the power of a colorful stage. SOUND: The sound of balloons being twisted is anything but "boring". Add fun background music, and you're set. MOVEMENT: When balloons are being tossed about, shot off fingers, twisted and balanced, you have a non-stop sea of movement throughout the room. AUDIENCE INTERACTION: It doesn't get more interactive than a room full of people each making a balloon animal under your direction. EXCITEMENT: Add together everything that's going on during a balloon show and how can it not be exciting? DANGER: The potential of a balloon popping raises the anticipation of any crowd. When the balloons do pop, that anticipation is restarted waiting for the next pop. MAGICAL: Turning a balloon into an animal is a very magical event.... especially when it happens in a child's hand! Thirteen pages of solid material just waiting to inspire you. After reading this book, you'll have a complete act using just balloons, a pump and a basket. 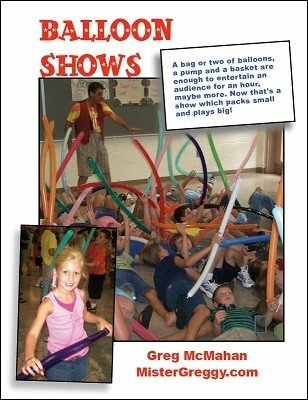 These notes feature various balloon routines and activities suitable for just about any family audience. From birthday parties to school assemblies, the routines and ideas in Balloon Shows will add plenty of laughs and fun to any children's show. 1st edition 2010, 14 pages. I just finished reading the balloon show book, I have to say I was very disappointed. The description said that "After reading this book, you'll have a complete act using just balloons, a pump and a basket." What you will have is a short and unorganized show. What I expected from the book was a seasoned performer showing some detailed routines instead of basic general things that can be done with balloons. I watched some videos of Mr. McMahan before I bought his book and I can say he is a better performer than he is an author. Save your ten dollars and buy a bag of balloons.